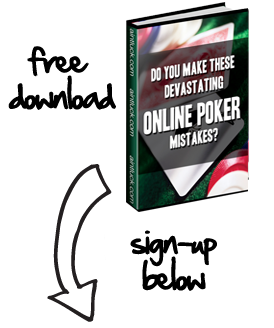 As a poker beginner, the most important things to remember are playing good starting hands and playing in position. As you become more experienced in online poker, you’ll find that a huge difference between success and failure is your ability to gain information on opponents. Obviously, the term “gaining information” is pretty broad, so here’s a more in-depth look at this process, as well as how it can help you win in poker. Oftentimes, new online poker players mistakenly assume that the psychological side of poker revolves around figuring out when players are bluffing. And while this certainly plays a role in poker, players don’t bluff nearly as much as one might think. Instead, the most common poker psychology involves determining what range of cards an opponent is willing to play from different table positions, and how much they are betting with these hands. Obviously it’s impossible to determine this information against an unknown opponent who you haven’t seen play. But as you play more hands against an opponent(s), you will start to notice patterns in the cards they are calling/raising with. For example, if another player raises 5X the big blind during preflop play from middle position, only to reveal a pair of 9’s at showdown, you know that they aggressively play middle pairs before the flop. The obvious benefit to gaining information from opponents is that it will help you handle difficult situations later on. To illustrate how this works, let’s say that you are holding a pair of 10’s, you’re in a heads-up SNG with an opponent who overplays top pair, both of your stacks are at 1,500 chips, and the blinds are set at 100/200. The flop is revealed to be 10-10-K rainbow and you raise, then get re-raised; you re-raise back, only to have the opponent go all-in. You obviously have an excellent hand with three 10’s. However, you also have to worry that your opponent could be holding K-10 for a full house. But seeing as how they’ve been known to overplay top pair and the blinds are becoming a factor, you should make the call in this situation since it’s likely that they are overplaying kings in hopes that you don’t have a set. The more information that you’re able to gain from an opponent, the more likely you will be to make sound decisions during difficult postflop situations. And this is the area where the most successful poker players excel!